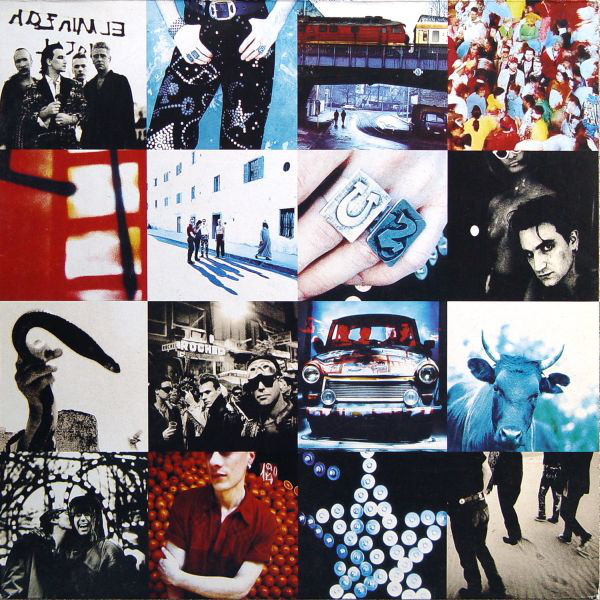 This was the album where U2's music changed completely. They ceased becoming either a) a post-punk guitar-driven rock band or b) an ambient, atmospheric but occasionally very commercial stadium rock band. What we got now were contemporary, thumping, bassy, often mechanical dance rhythms backed by layers of industrial-sounding fuzzy, buzzy guitars. David "The Edge" Evans' trademark guitar still cut through occasionally and the Berlin-derived influence of David Bowie's "Heroes" and bits of Talking Heads' "Fear Of Music" was all over it as well. It was an intoxicating brew, but often an impenetrable one tailor-made for stadium bombast however, with flashing light systems and increasingly elaborate stage sets. One listen to the opener, "Zoo Station", confirms that. It's great though, loaded with Bowie-esque late seventies guitars, weird noises and Cold War atmosphere. The influence of Krautrock bands like Neu! and Kraftwerk were never far away, either, or the "Madchester" scene dance-influenced rock bands like The Happy Mondays, The Stone Roses and The Inspiral Carpets could all claim an influence. U2 were becoming a "dance-rock" band. Bono's lyrics and persona were now going into full pretentiousness overdrive and they lost many followers due to this and attracted quite a lot of scorn from many who said "I don't mind U2 but I can't stand Bono". His regular pronouncements on world issues were beginning to get tiresome, however earnest and well-meant. That is not to say that this album was not packed full with commercially-viable material, however. Just listen to the instantly appealing "Even Better Than The Real Thing" and the now iconic "One" as examples. The beautifully bassy and mysterious, seductive vocals of "Until The End Of The World" is one of my favourites. It contains great pulsating rhythms and "proper" drums (not programmed drum machines). It is U2 at their early nineties best. The best of this new incarnation. "Who's Gonna Ride Your Wild Horses" begins in a haze of buzzy guitars and suddenly launches into a huge anthemic chorus made for stadium fist-pumping. Yes, there was a sombre, introspective sound to this material but U2 always knew a good hook, and these hooks ensured Radio Two play. Throw in a few "hey heys" and "sha-la-las" and you ensure commercial success despite the bleaker parts of the new soundscape. In the way that David Bowie changed his musical output many times, this change that U2 underwent was quite similarly noteworthy (although nowhere near as regular or different as Bowie's changes). They still did it, though, and it was a brave move from a group over ten years into their career. 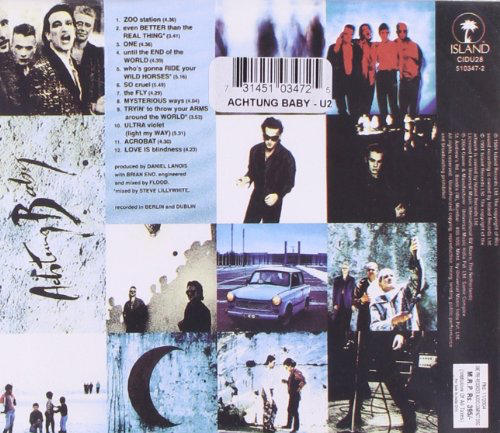 "So Cruel" is another slow number with a simply massive grinding bass underbeat and a yearning, song vocal from Bono, whose voice has become more characterful, less whiny, much fuller. "She wears my love like a see-through dress..." is a great line. A lot of the songs on here are love-inspired as opposed to gripes about the state of the world, another notable shift in approach. A really dense, muffled dance beat is on "The Fly", which surprisingly was a number one single. It was probably U2's least commercial single. No real hook to it, just a crashing sonic attack like a shift in a sheet metal factory. I love it though. It has some intoxicating guitar sounds. "She Moves In Mysterious Ways" has an absolute killer screechy but rhythmic intro and a sublime, uplifting catchy chorus. Now, I love heavy bass, but "Tryin' To Throw Your Arms Around The World" has one of the heaviest I have ever heard in a rock context. Vocally, it has hints of Deacon Blue to me. "Ultraviolet (Light My Way)" is a sombre, intense and pounding rock number whose starkness is again interjected by a catchy refrain and some addictive guitar lines. Under it is the omnipresent huge bass that underpins this whole album. "Acrobat" is a little-mentioned but seductive number with a bit of that old trademark guitar crying in under the muscular drumbeat. "Love Is Blindness" is the usual haunting closer, a plaintive lovelorn vocal over another rumbling bass line. 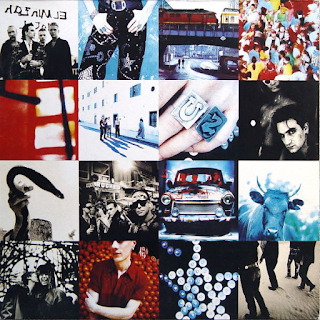 There is a strong argument for this being U2's best album. It is certainly the best of the "industrial" albums that followed this and for me, it out-does "The Joshua Tree". "War" was excellent, of course, but it was of its time and genre. This is probably the most realised album and their true pinnacle.